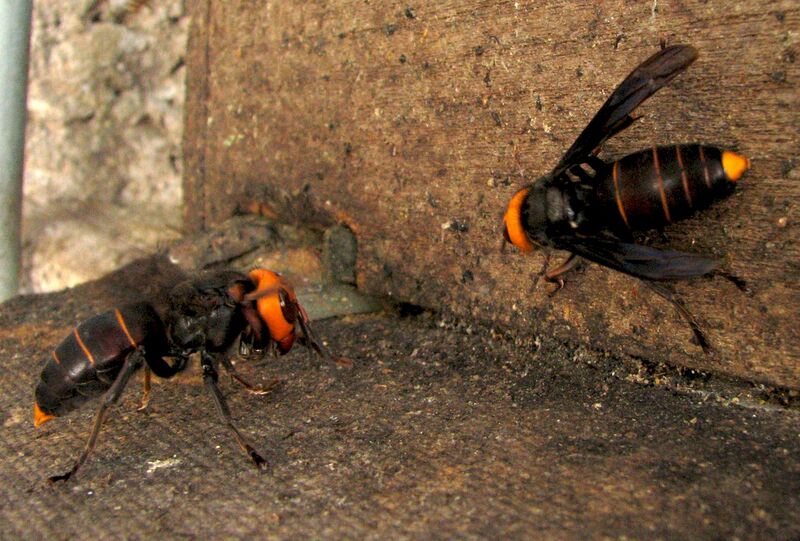 The species Vespa mandarinia is a very large-sized wasp with a Body length 27 - 45 mm; unbelievable, the queens reach 5.5 cms in length! SE part of Asian Russia: southern regions of Primorskii Krai, Korea, China, Indochina, Nepal, India (Kurzenko, 1995), Shri Lanka, Thailand, Japan (In Japanese: Ohsuzumebati). 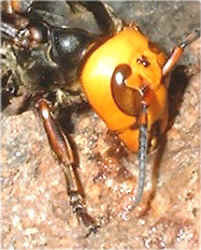 The Head is orange rather wide than long; the compound eyes and ocelli are dark brown; antennae dark brown with orange scapes, mandible orange with black tooth. The clypeus is orange coarsely punctured and posterior side of clypeus with narrow rounded lobes. Thorax and propodeum with golden tint, scutellum large with a medial deeply-impressed line, postscutellum bulging and overhanging the propodeum, beneath the postcutellum in transverse hollow produced triangularly down from the middle and continued as a medial furrow to the apex of the propodeum. Forelegs are orange with dark brown tarsi, the mid- and hind legs dark brown. 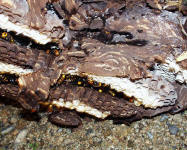 Wings are fuscous brown; tegulae also brown. 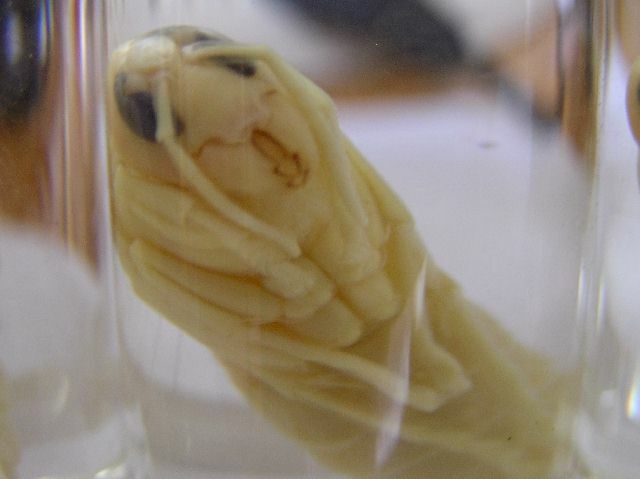 Gaster pruinose, dark brown; with narrow yellow bands at the posterior margins of the tergite, the sixth segment is entirely yellow. Additional this gigantic, voracious predator has a quarter-inch stinger (6.35mm)! 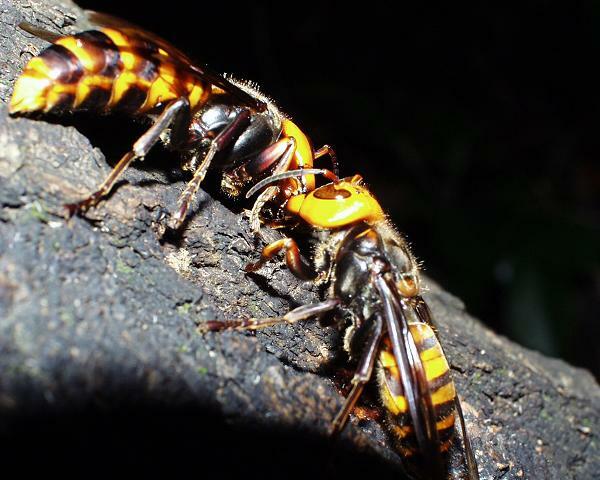 People are usually not the Japanese giant hornet's prey, but those who have felt its sting describe the pain as excruciating and very painful. 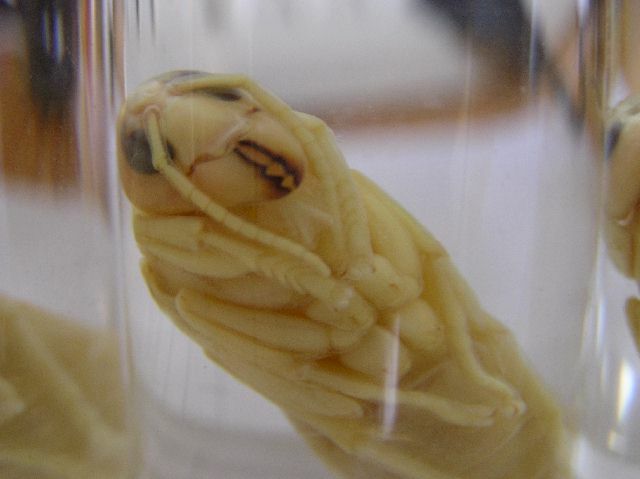 Masato Ono, an entomologist at Tamagawa University, near Tokyo, said it's "like a hot nail through my leg." 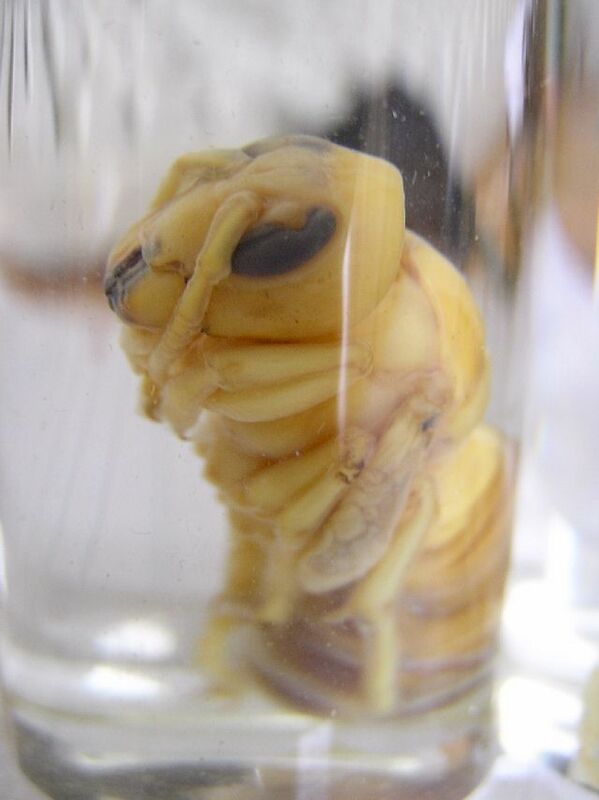 Vespa mandarinia is easily recognized by the head which is strongly widened and produced behind the compound eyes, first to fifth of gastral segments dark brown; with narrow yellow bands at the margins of the tergites, sixth segment entirely yellow. 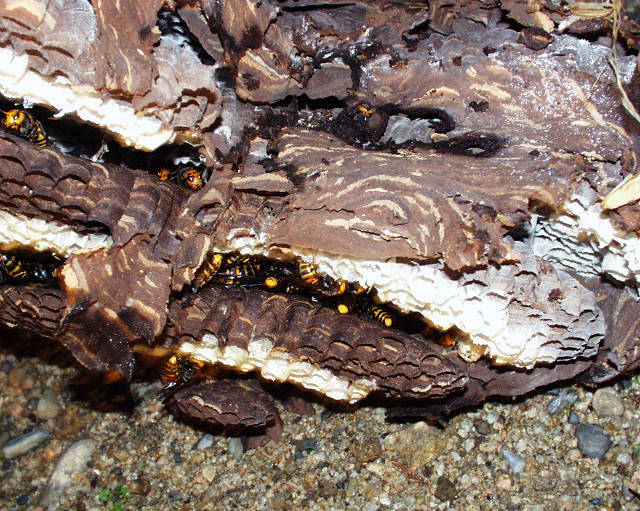 This is a very interesting topic: Bees handle invading wasps by 'baking' them alive! The Japanese giant hornet, Vespa mandarinia japonica, preys on other species of bees and wasps. When a solitary hunter finds a nest, it marks it with a secretion from its van der Vecht gland. 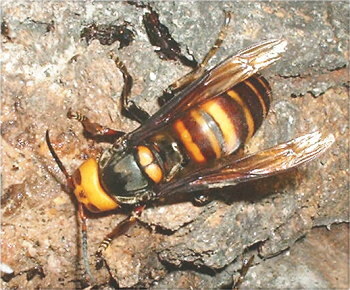 Other hornets in the area congregate to the area, and they begin a mass attack on the colony. 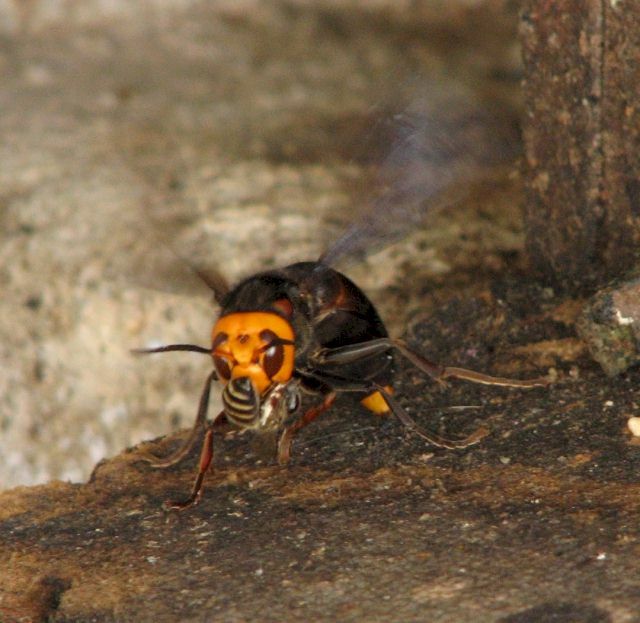 While they are efficient at wiping out hives of the introduced European honeybee Apis mellifera (they are killed at rates as high as 40 per minute), the native Japanese honeybee, Apis cerana japonica, has an interesting defense against the predatory hornet! 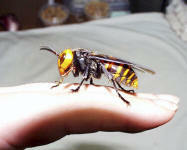 The Japanese honeybees can detect the hornet's secretion, and attack incoming hornets en masse. With approximately 500 honeybees surrounding the hornet in a tight ball, the temperature within the cluster rises to 47º C (117º F), which is above the upper lethal limit range of 44-46 degrees for the hornet. This temperature is too high for the hornet, which quickly expires, but does not harm the honeybees.This temperature does not aversely affect the honeybees because their upper lethal limit is slightly higher, 48-50 degrees. Japanese wasps appear usually after the middle of August. 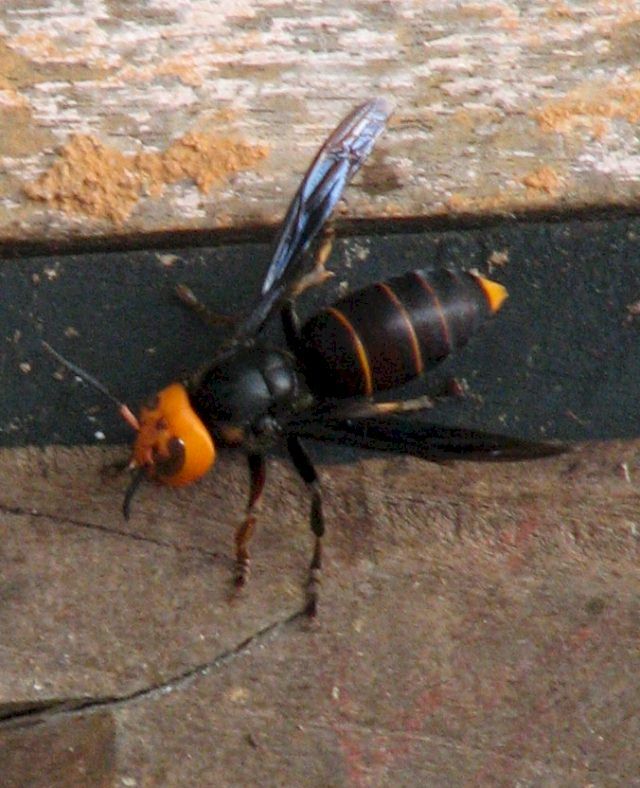 The types most often seen at the bee farm are Vespa mandarinia, Vespa analis insularis and Vespa simillima Smith. The Vespa simillima Smith only catch honeybees one at a time, roll them into a ball, and then carry them away. But the Vespa mandarinia attack and crush honeybees one after another with their mandibles until all the honeybees are wiped out, then carry away all of the larvae. 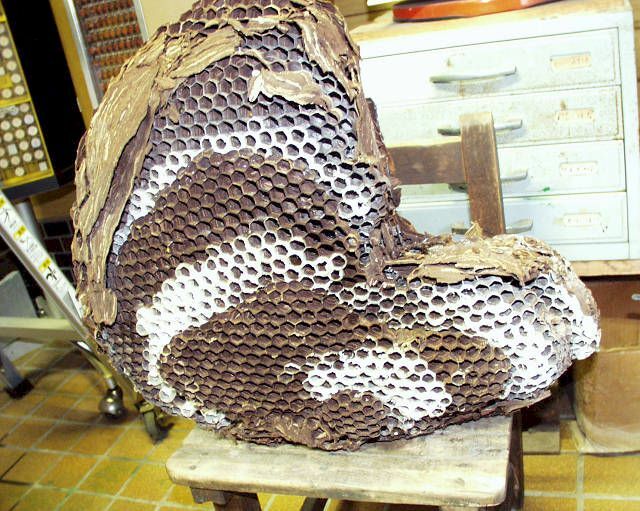 If a colony of about 30.000 European honeybees (Apis mellifera) were to be attacked by 30 giant hornets (Vespa mandarinia japonica) they would be wiped out in 3 hours. 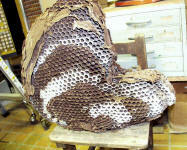 The hornets would enter the nest, kill the bees, and take their bodies home to their young. After a few successful trips, hornets rub a pheromone on the nest that signals other hornets to attack. 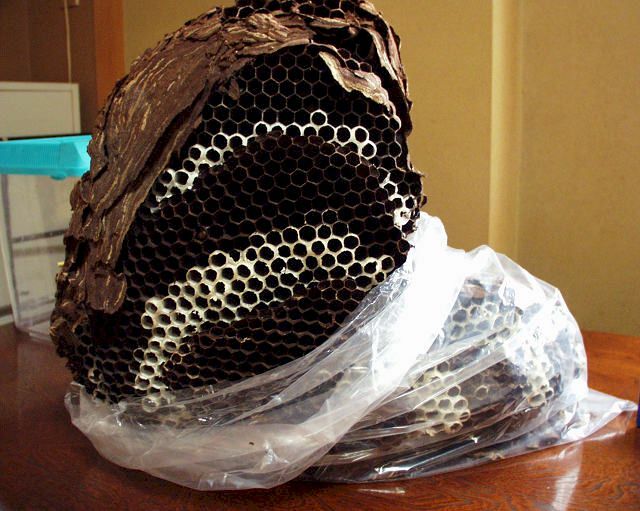 So in autumn, most beekeepers in Japan think it is quite normal, that measures are needed to protect the honeybees from these natural enemies. 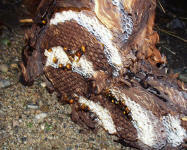 They attach very often a wasp trap to the front of the hive entrance. Vespa mandarinia - dark colour form. The head is bright orange, the abdomen black with very very thin orange bands, and again a bright orange tip (where the stinger comes out). It likes also to hover outside beehives, and eat the honeybees. Photos from India, at altitude 6,500 feet in Uttarakhand - known around there as "Tiger Bee". 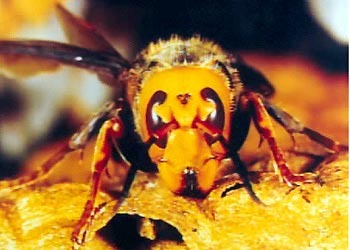 The hornet above has a bee (probably Apis cerana) in its jaws. It was taken with a good zoom lens. The hornet didn't seem to be at all disturbed by the presence of the photographer, interested only in catching a bee. Though once he did charge his hand (when he was coming in close for a macro shot). It takes between 5 seconds and two minutes to catch a bee, depending perhaps on the number of bees present and its luck. 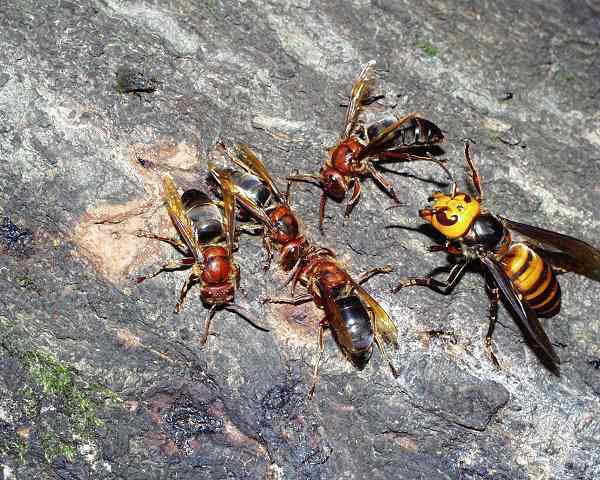 The toxicity ... "three hornet stings will kill a man"
The toxicity of Vespa mandarinia venom is actually somewhat lower than that of honeybee (Apis mellifera) venom. The median lethal dose (LD50), a dose at which 50% of subjects will die, is 4.1 mg venom per kg body weight (injected in vitro in mice) for Vespa mandarinia and 2.8 mg/kg for honeybee venom. 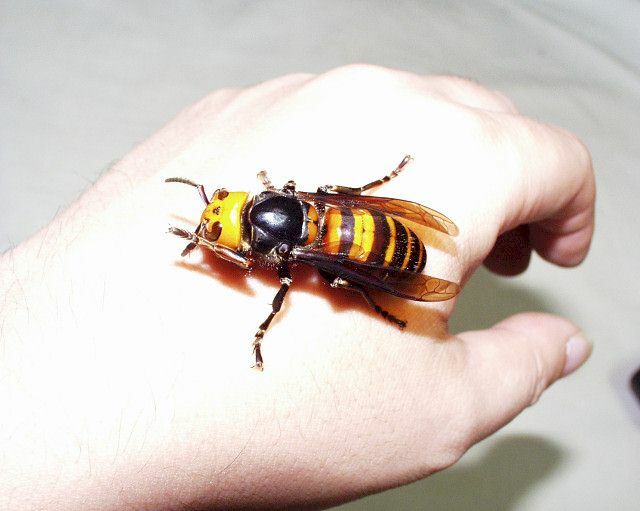 Whereas the honeybee is more toxic, the much larger hornet usually injects a greater quantity of venom, so a hornet sting may be in fact a bit more dangerous. But given the fact, that humans will usually survive several dozen or even hundreds of bee stings without lasting consequences, it becomes evident that claims like "three hornet stings will kill a man" are nonsense. No healthy man dies from only three Vespa mandarinia stings! Yellow Hornets (Vespa simillima Smith, 1868) are common in Asian Russia and adjacent territories and Japan. 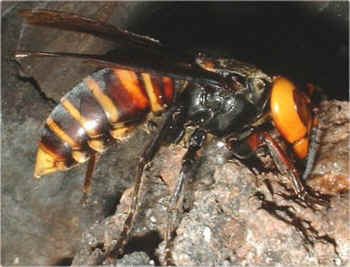 It is not the same species as the big hornet (Vespa mandarinia). The yellow-hornet makes greyball-shaped nests built on structures or in trees. Beekeeper don't like them, because when a yellow hornet approaches to the nest of the Japanese honeybee in the loft, the yellow hornet kills them one by one, hovering near the entrance in the air. 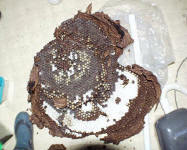 But there are so many honeybees in the nest, it is not a big damage for them. TOKYO -- WHEN Naoko Takahashi flew to a record-breaking victory in the women's Olympic marathon in Sydney, Australia, last September, she had the power of tiny wings working for her. Miss Takahashi, like many Japanese long-distance runners, is a devotee of a little-known drink that its proponents believe may revolutionize sports requiring endurance and rigorous training. Sold here under the brand name Vaam, the concoction contains a synthetic version of the juice that gives Japan's giant hornets the strength to fly distances of about 60 miles a day at speeds of almost 25 miles an hour. This drink is very effective in sustaining stamina and energy, said Yoshio Koide, Miss Takahashi's coach and perhaps the biggest proponent of Vaam's benefits. "I had tried everything before tea, lemon tea, honey but nothing worked very well." Mr. Koide does not have much of a track record to support his conviction that Vaam gives his athletes an edge, and what scientific evidence of the benefits there is comes from tests done with mice. Of course, supplements purporting to enhance athletic performance are nothing new. Gatorade started out in the 1960's as an electrolyte drink aimed at helping athletes sustain their vigor by replacing potassium and sodium lost in sweat. In the 1970's, bee pollen was a fad among American sprinters who believed it gave them a spurt of energy. Yuko Arimori, an Olympic medal- winning marathoner, said that she had tried the pollen, but it tasted terrible and had no benefits that she could detect. In 1993 and 1994, Chinese women whose coach claimed they ate worms and soup made from the blood of soft-shelled turtles trained by running up to 22 miles every day and broke world distance records at an astounding pace. The world was never really sure whether it was the turtle and worm diet or drugs that produced those victories. Several Chinese runners were later suspended after testing positive for drugs. Craig Masback, a former world-class miler in the United States, said that his parents would remind him as a child to eat candy bars for energy before races. Then his high-school coach recommended dextrose tablets, while Lee Evans, the Olympic 400-meter champion, told him to eat raisins before competition "because it is a fruit with a burst of sunlight." Lasse Viren, the Finn who was accused of blood doping after his Olympic victories in 1976, said reindeer milk was the secret of his long-distance greatness. "This is just symptomatic of people always looking to supplement their diet with something that will either actually or with perception enhance performance," said Mr. Masback, who ran the mile in 3 minutes 52.02 seconds in 1979 and now is the chief executive of USA Track & Field, America's national governing body for the sport. But Takashi Abe, the scientist at the Institute of Physical and Chemical Research whose work uncovered what he says are the benefits of the hornet liquid used in Vaam, insists that the drink that Miss Takahashi uses is different. "Things like Gatorade seek to replace electrolytes and other things lost during athletic performance," said Dr. Abe, who worked for several years at research institutes in the United States. "They add things to the body in an effort to give it more energy to burn, but Vaam works by helping the body burn the energy it already stores more efficiently." Top athletes in Japan say the drink works wonders in preventing dehydration, maintaining energy levels and preventing fatigue. "About half an hour after I drink it, I can feel energy penetrating all of my muscle groups," said Ms. Arimori, who won a silver medal in the marathon at the Olympics in Barcelona, Spain, in 1992 and a bronze four years later in Atlanta under Mr. Koide's coaching. "In Atlanta in 1996, shortly after the 30-kilometer mark, I got really dehydrated, but I drank Vaam and felt much better." "Water makes you thirsty soon after you drink it, but if I drink Vaam, I can run 5 or 10 kilometers without needing to drink any further." Ms. Arimori has appeared in advertisements for the product, which is made by the Meiji Milk Products Company, but does not claim it is a cure-all or say it guarantees victories. "It's mostly good for training for long-distance races and other endurance sports," she said. "It's not for every athlete. I don't think it would be that effective for a gymnast, for instance." Ms. Arimori, Dr. Abe and others conceded that some of the drink's benefit might be psychological. "I think there is also a mental element to Vaam, but that's important in sports, too," Ms. Arimori said. 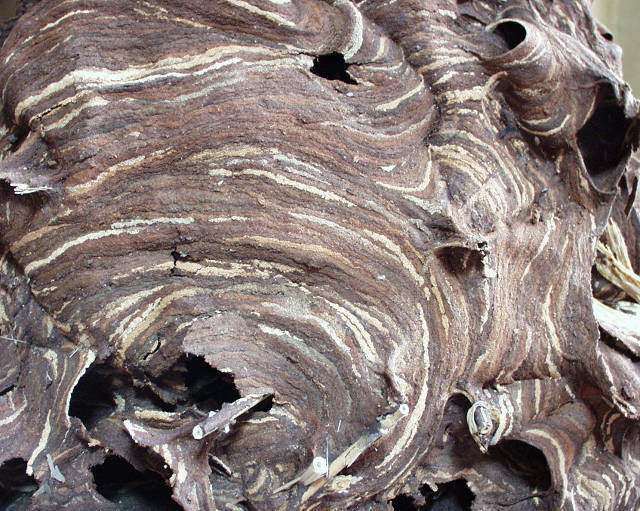 Vaam, which stands for vespa amino acid mixture, contains the same amino acids that are in the liquids secreted by hornet larvae. 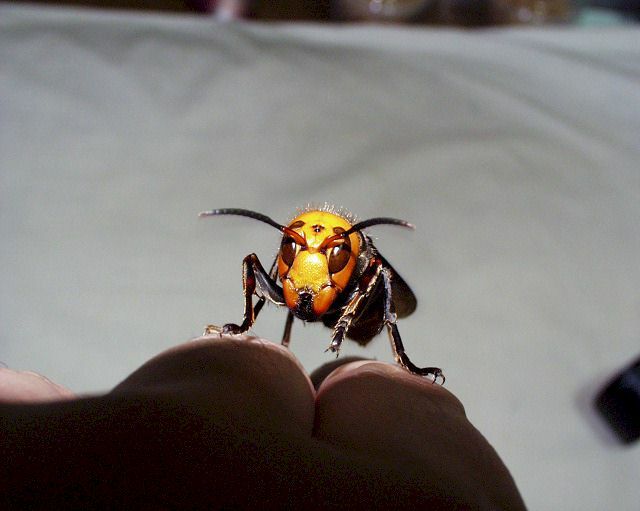 Those liquids are the sole diet of adult hornets, known scientifically as Vespa mandarinia, whose wings flutter up to 1,000 times a minute and are strong enough to lift objects weighing more than six pounds even though worker hornets weigh only 0.09 ounce on average. Dr. Abe said the amino acids generated by the larvae set off a mechanism that converts fat to fatty acids that can be burned for energy. Typically, the human body burns glycogen to produce energy, but because it stores only about 1,800 calories worth of glycogen, the supply runs out quickly. Thus, marathoners and athletes in other endurance sports constantly seek to replenish their stores of glycogen with supplements. The body contains far bigger reserves of fat, about 27,000 calories' worth in the average 132-pound person. But the body has far more trouble burning fat than glycogen and thus burns glycogen first. Vaam expedites the metabolism of fat and also promotes better hydration of the body, Dr. Abe said. Burning fat produces sweat Ms. Arimori and the boxer Hong Chang Su both said that Vaam makes them sweat quite heavily and thus improves hydration, Dr. Abe said. "We have a lot of fat inside our bodies, and usually we can't use it unless we're starving," he said. "These amino acids can help us make use of our stores of fat." Meiji, which produces Vaam, has yet to tap what may be the biggest market for the drink: dieters. Shinro Sugiura, president of the Aerobics and Fitness Association of America Japan, said Vaam had several devotees among members of the Azusawa Garden Sports Club. Azusawa, which serves as the fitness association's headquarters, features vending machines with the drink in the locker rooms. "Most people work out to lose weight and stay in shape," Mr. Sugiura said. "Vaam acts as an accelerator in helping the body burn fat." Dr. Abe said he had even used it to prevent and cure hangovers. "The liver function during alcohol intoxication is improved by Vaam," he said. "If I drink Vaam before drinking alcohol, I don't have nearly such a bad hangover as I do when I don't drink it." The drink does not seem to run afoul of international sports' doping rules, although no athletic body has asked to test Vaam. "My runners were all tested in Sydney," Mr. Koide said. "They all drink Vaam, and none of them tested positive for doping." Studies conducted by Dr. Abe showed that mice that drank Vaam could swim almost twice as long as those drinking only water, and 25 percent longer than those drinking supplements containing casein, a protein found in milk. The blood of the mice drinking Vaam contained fewer fatty acids, an indication of how efficiently the body is burning fat, than that of mice drinking casein, glucose or water, the studies showed. The level of lactic acid, which tends to rise as the body burns glucose and can lead to muscle cramps, was also far lower in the blood of mice drinking Vaam than in that of the other mice, according to the studies. Ms. Arimori and Mr. Sugiura said that Vaam's price a 6.7-ounce can costs about $2.20 at current exchange rates, compared with other sports drinks that cost about $1.58 has inhibited sales. Meiji would like to sell Vaam in other parts of the world, said Masayoshi Shimbo, the company's executive in charge of selling the drink. Mr. Sugiura has been promoting the drink in Taiwan and Hong Kong. But Meiji may never be able to tap the United States market. Vaam contains a small amount of tryptophan; sales of dietary supplements containing L-tryptophan were prohibited in the United States after a 1989 outbreak of eosinophilia-myalgia syndrome, or E.M.S., a potentially fatal disease of the immune system. Dr. Abe said attempts to eliminate tryptophan from Vaam have so far proven unsuccessful. Coaches and athletes stress that the biggest benefit of the drink is the ability to train longer and harder. "For boxing, which is a rapid sport with short, quick movements, not an endurance sport, it's not so effective," said Hong Chang Su, the boxer known in the ring as Masamori Tokuyama and the World Boxing Council's super flyweight champion. "But when I was training, I drank it every morning because I have lots of road work and jogging, and it helps me maintain endurance and energy." His trainer, Hideo Kanazawa, admits that Vaam is a bit of a mystery. "I don't know exactly how this drink works, but while using it, he was able to win and has continued to win," he said. "That's about all that matters, isn't it?"